I've said it before and I'll gladly say it again: animation is a hideously unrated medium. So many masterpieces have been written off as "childish" simply because they were drawn or digitally produced; this stigma surrounding animation persists today, primarily because so many mainstream animated films are, in fact, aimed at children. However, a film's target demographic doesn't exclude others from enjoying it, especially when it takes great pains to make its story intelligent and well-structured. This is the case for several films (particularly the stop-motion animated fare, a phenomenal subgenre that often explores darker subject matter, such as 2009's Fantastic Mr. Fox and Coraline). Another subgenre that typically refuses to shy away from mature themes and frightening images is anime. We don't always have a developed idea of Japanese entertainment, which is why we are so shocked by the material that comes from Japan. While Akira is probably the best example of an anime that rejects Western animation tropes, Studio Ghibli movies bridge the gap between demographics with ease. Their stories are enchanting, their characters lovable, and their art breathtaking: simultaneously, they explore much darker themes than Western films. Spirited Away is yet another example of this happy medium Studio Ghibli has become so renowned for. Spirited Away opens with Chihiro Ogino (Daveigh Chase), a ten-year-old girl who is moving away from her school to live in a different neighbor with her parents Akio (Michael Chiklis) and Yuko (Lauren Holly). After straying from the main road, they stumble upon an abandoned fairground, which— to Chihiro's dismay— her parents insist on exploring. She encounters a strange boy named Haku (Jason Marsden) who tells her she must leave before sundown; however, when Chihiro returns to her parents, she finds that they have been turned into pigs. When sundown arrives, Haku helps her avoid being seen by a strange new race of shadow-people, sentient animals, and odd creatures who despise humans, and tells her she must find work if she has to stay. Chihiro tries first with boiler room man Kamaji (David Ogden Stiers), but is rejected on the grounds his sentient dust mites do work for him; she is then reluctantly hired by Lin (Susan Egan) in the bathhouses. However, Chihiro must first sell her name to the tyrannical witch Yubaba (Suzanne Planchette) and is renamed Sen. Now secure in the spirit world, Sen must find a way back home and to her parents, all while dodging Yubba, struggling to protect Haku, and trying to save the spirit world from a shadowy demon named No-Face (Bob Bergen). Like most Studio Ghibli films, Spirited Away is difficult to accurately summarize. The gist of the plot concerns Chihiro navigating the spirit world and searching for means of escape, but it often meanders in places like the boiler room or the bathhouses to explore other concepts. This is a film bursting with imagination and creativity: however, its runtime doesn't allow it to fully cover all corners of this universe without allowing the story to completely derail. Unlike other films like The Cat Returns, where the cat world was as richly expressed as, say, the Beast's Castle in The Beauty and the Beast, Spirited Away never completely explains anything. It's a shame too, because I've never watched a movie so imaginative and unique in its handling of a new universe. What the movie lacks in universe-exploration and focused storylines, it makes up for in characters and sheer creativity. Chihiro is the heroine all little girls should look up to: she's curious and inventive, but also emotional and appropriately frightened by her new situation. She reaffirms to young girls that you can be smart and courageous and kind and even upset when things are bleak. The other characters, particularly Yubaba and Lin, are expressed magnificently through passionate voice work and unique animation (see how easy it is to make your female characters look different, Disney?) Every background creature has their own design that sets it apart from the other. We connect easily with these characters because their struggles, however fantastic, are not so different from the ones we face. Spirited Away is one of the most lush animated films I've ever seen. While I'm no stranger to the talent of Studio Ghibli's animation team— Grave of the Fireflies has brilliant color palettes and character animation— they really shine with this film. Every setting is richly expressed and realized with differing color palettes: the boiler room is grey and varying shades of red and orange, the bathhouse is done in rich clarets and gold, the river train is grey and hazy blue. The detail put into every character is astounding: Chihiro has the sway-backed, gawky run of a young girl, Yubaba's wrinkles are contrasted by her jewels, No-Face is sleek and somewhat disturbing. This is the animation that sets anime apart from Western animation, the sort of immaculate, enchanting eye-feast we so rarely see in today's animated world. With all that said, is Spirited Away as wonderful as critics claim? Well, perhaps I'm not the one to judge. While I thoroughly enjoyed certain aspects of it, the film as a whole seemed a touch complex and sometimes monotonous. I can imagine a young child struggling to catch up with the story or even being frightened by scenes like No-Face's attack and Chihiro's parents being turned to pigs. There's no doubt that Spirited Away is an animated carnival of spectacular sights and sounds: it's just not as enchanting as the spirited world promises to be. 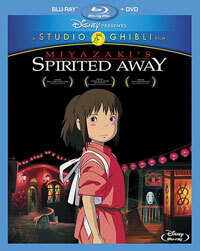 Spirited Away made me distrust soot on Blu-ray Disc courtesy of Walt Disney Studios Home Entertainment. The film has been letterboxed at 1.85:1 and the Disc contains an AVC 1080p HD transfer which runs at an average of 25 Mbps. The image is very sharp and clear, showing no grain and no defects from the source materials. The colors look very good (although, like a lot of animation from Japan, they weren't quite bold enough for my taste) and the image is never overly dark or bright. The picture is never soft and the level of detail is excellent (and doesn't reveal any flaws in the animation). The depth is good as well. The Disc carries a DTS-HD Master Audio EX 6.1 track which runs at 48 kHz and an average of 4.5 Mbps. (Although the menu states that this is a 5.1 track.) The track provides clear dialogue and sound effects. The stereo effects are nicely done, as they show good separation. The surround effects work quite well during crowd scenes, as they treat us to the many small noises made by the various creatures. The Spirited Away Blu-ray Disc contains a selection of extras. We begin with an "Introduction by John Lasseter" (1 minute) who gushes over the movie. "The Art of Spirited Away" (15 minutes) is sort of a making-of featurette, but it's told through the perspective of Disney. While it does contain comments from Director Hayao Miyazaki, it also features interviews with Disney animators and those who worked on the English translation. So, we learn a little about the movie, but not enough. "Behind the Microphone" (6 minutes) takes us into the studio to show the American actors providing the dubbing for the film. "Original Japanese Storyboards" (124 minutes) shows us storyboards for the entire film. "Nippon Television Special" (42 minutes) is a show from Japan celebrating and covering the creation and release of Spirited Away. This takes us to Miyazaki's retreat where he works. We get eight THEATRICAL TRAILERS and ten TV SPOTS from Japan.